"What happened at Amritsar thirty years ago led to a tragic loss of life and must never be forgotten. A generation on, I know the scars still run deep in the Sikh community here in Britain and around the world. Last year I was privileged to be able to visit the Golden Temple and I saw for myself its beauty and calm – the idea of such an appalling event happening in such a place is almost beyond comprehension. I’d like to reassure the Sikh community, especially in this country, that we are taking very seriously the question of whether Britain advised on the Indian military operation of 1984. We understand your concerns and we are listening. As soon as these papers came to light, I ordered an urgent investigation to establish the full facts as soon as possible. It’s critical we get to the bottom of the extent of British involvement – not least because we owe it to British Sikhs in our country today. The Sikh faith is a real symbol of how religion can be a force for integration rather than division and you have made a truly enormous contribution to our country over the years. From your ancestors who served our country loyally in two world wars – to the values of honesty, charity and hard work that underpin your faith – Britain has an enormous amount to be grateful for. 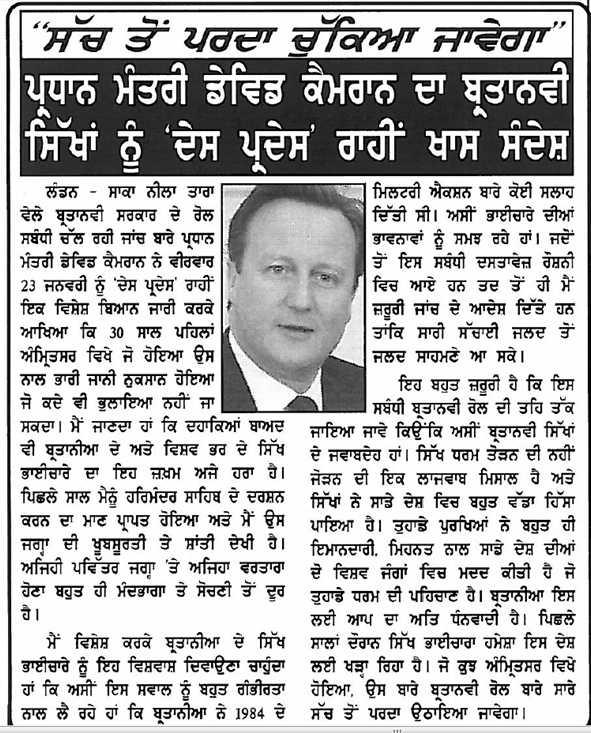 Over the years, the Sikh community has always been there for this country. I never forget that and know that nothing less than the truth about allegations of British involvement in what took place at Amritsar will do. "